Do you know that feeling when you read a book and you’re a bit numb after reading it because you have no feelings on it at all? I hate that feeling. I hate pouring my time into a book, only for it not to deliver anything at all. Luckily, Starring Kitty made me feel the complete opposite. Starring Kitty is pretty much one of the best books you could ever wish to read, and I don’t ever say that lightly. Instead of writing five pages worth of comments, I’ve decided to do a graphic to explain just how perfect Starring Kitty is. In my head, I have a checklist of things that make a book absolutely perfect, and I know many people have something similar. Above is a not so cool version of the thing in my head. Check one for Starring Kitty! 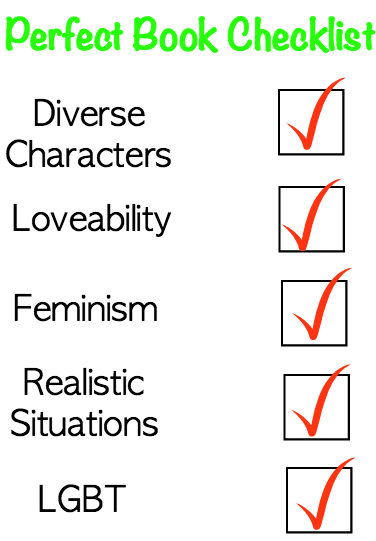 Diverse characters is something I expect in all novels because we live in a world where THERE IS MORE THAN ONE TYPE OF PERSON WALKING DOWN THE STREET. We have racially diverse characters, illness is portrayed perfectly, and even more that I’ll leave a surprise for you if you haven’t read it. Yes, I totally just made that word up, but I’m hoping you understand what it means. For a book to become a favourite of mine and one I will love unconditionally, it has to be so loveable it feels like my own child. Check two for Starring Kitty! It has a quality that just makes it amazing, which I’ll discuss in further points. It’s pretty much a given that if a book has a feminist character(s) then I will love it and rate it five billion stars. It’s something we still don’t see enough of and I really want that to change. It’s so important that young girls read books with characters that they can admire and aspire to be like, and feminist themes and characters are the best of the best. 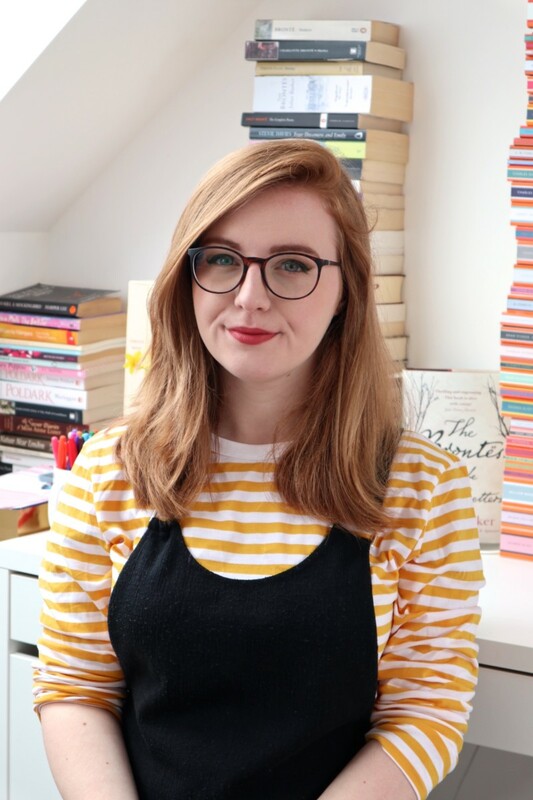 Being a teenager myself, I often struggle to find books that feel like the things going on are actually happening to teenagers, and are realistic enough that you don’t have to think twice about them. I felt like Starring Kitty could happen to me – the school experiences were similar to my own, the friendships similar to my own. I’d even go so far as to say it is THE MOST realistic novel I’ve read about characters my own age. This is one I don’t want to make too much fuss about because, you know what? It doesn’t matter. I don’t want to compare the romance in Starring Kitty to a non-LGBT one because that wouldn’t make any sense. I love how it felt normal, as it should do. It just felt right, and I loved that! Starring Kitty can be read by absolutely anyone. It doesn’t matter if you’re young or old, or usually read books like it. You will instantly fall in love with it, just as I did. OK, the fact that it has 4 things that I absolutely love in all of my media (I’m not too fussed about the realistic situations thing) makes me think I need to check this out some time soon. Thanks for the review-the new format is awesome! This checklist really makes me want to read the book! I mean, diversity, despite being a necessity, is rarely well presented. And it’s especially good to hear that illness is portrayed perfectly (too often in novels the characters become defined by their illness which is so frustrating!). Feminism and LGBT are also great themes. I’m an avid feminist & I’m especially interested in the presentation of women in film, tv & literature so this book sounds right up my street. The importance of strong female role models cannot be stressed enough! And, well, the importance of showing casual LGBT romances is obvious and you said it perfectly with “it felt normal, as it should do”. Loveability & realistic situations are, also, kinda brilliant. Ooh, really looking forward to reading this! what a great review, just loved your graphic too. How did John Green come to tweet you? that sounds very exciting.